File - Moammar Gadhafi at Cairo University, May 27, 1996. Is Libya ready for a leading political figure who looks like Moammar Gadhafi? Ahmed Mohmamed Gaddaf al-Dam, the late dictator’s cousin, is seen by some observers as a man to watch. From exile in Cairo, he calls for the remnants of the ousted government to be included in a political settlement the United Nations is advocating. And he says that without them, a U.N.-brokered unity government struggling to get off the ground will fail and the turmoil engulfing the country will persist. Gaddaf al-Dam ’s regular appearances on Egyptian television outlining his proposals for ending the chaos in Libya, combating the threat of Islamic State militants and resolving the standoff between the country’s two rival parliaments, the General National Congress (GNC) in Tripoli and House of Representatives (HoR) in Tobruk, are resonating with powerful tribes in eastern and southern Libya, say observers. “He is a moderate figure and influential with some of the tribes who see him almost as a head of state,” said Hafed al-Ghwell, a Middle East analyst who formerly worked with the Atlantic Council’s Rafik Hariri Center for the Middle East. Gaddaf al-Dam, who bears an uncanny resemblance to a youthful version of his late cousin, has been meeting regularly with tribal leaders along the Libyan-Egyptian border. Ahmed Gaddaf al-Dam, cousin of Libya's former president Moammar Gadhafi, talks during an interview with Reuters at his apartment in Cairo, Oct. 9, 2014. His political work, though, elicits sneers and threats from the mainly Islamist politicians in the Libyan capital, some of whom were exiled during the Gadhafi dictatorship. They say they will never work with anyone from the ousted government. That hasn’t prevented Gaddaf al-Dam from continuing to promote the idea of reconciliation between Libyan revolutionaries and the old guard. In a phone interview with VOA, the dictator’s onetime trusted international fixer insists he harbors no political ambitions. “What we are trying to say is, ‘Let’s save our country,’” he said. “We are not struggling to lead the country. We are struggling to keep our country in peace because it might not exist tomorrow." Since the 2011 NATO-backed ouster of Moammar Gadhafi, most media attention has focused on the late dictator’s children when a possible revival of Gadhafi family fortunes are discussed. Three of the dictator’s sons were killed in the uprising and three sons are in jail — two in Libya and one in Lebanon. Only the strongman’s daughter, Ayesha, and one son, Muhammad, remain at liberty, in Oman. 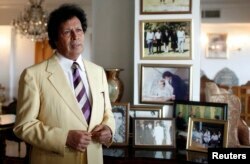 Increasingly it is Gaddaf al-Dam who is emerging as the Gadhafi clan’s standard bearer. He is the official spokesman of the Gadhafi tribe, a branch of the large Berber tribe known as Houara, whose members are spread across North Africa. He also is related to leaders of the Awlad Ali tribe, which dominates parts of Libya’s Sahara, as well as western Egypt and eastern Libya. He enjoys close ties to Egypt’s ruler Abdel Fattah el-Sisi — they trained at the same military academy in Egypt — as well as Saudi royals. Gaddaff Al-Dam was a highly trusted member of the Moammar Gadhafi's inner circle. He was one of five top loyalists, including Abdullah al-Senussi, the dictator’s brother-in-law and intelligence chief, tasked with countering exiled dissidents overseas. They targeted specifically opposition groups like the National Front for the Salvation of Libya, which they were convinced had the backing of the CIA and British security services. But Gaddaf al-Dam broke with Gadhafi in the first few days of the 2001 rebellion, disagreeing with the government’s harsh repression of the uprising and fleeing to Cairo. “I was not against him but I did not agree with the way the protesters were treated in the first few days of the uprising. I wanted a different way of dealing with it and the new generation needed to be talked to in a different way,” he said. He said the popular protest movement did not at first amount to a revolution but that NATO’s intervention, which he said was ill-advised, transformed it into one. Gaddaf al-Dam's critics maintain he broke with the dictator because he realized the regime was finished and he wanted to avoid the consequences of remaining by his side. Since Gadhafi's fall, Libya has splintered. In December, United Nations diplomats and Western leaders announced the creation of a Government of Naitonal Accord, but the House of Representatives still hasn't recognized it. The priority, he argues, is to stop Islamic State militants from expanding their reach in the country. “There are thousands of them now in the country and if it persists, then Libya will become like Somalia, there will be no peace in the Mediterranean or across North Africa, and we will have conflict for 20 years or more. Let’s wake up and forget about the past. Let’s build a new country,” he said. While welcoming the new unity government, he harbors doubts it will prevail. He said the newly announced members of the government have “no experience and I don’t think they will be able to do anything for Libya.” He said former government figures should be in the administration. “Why not? It is their country too,” he said. It isn’t a sentiment embraced by Libyan revolutionaries.